I grew up with a sister who participated in cheerleading, and I know firsthand that it is not easy. Hours and hours are put into practicing the chants heard at the games. These cheerleaders have to be tough– my sister would come home with bruises all over her legs from falling. Cheerleaders who are flyers can particularly relate to this, as they are thrown in the air and must trust their bases to catch them. Cheerleaders are athletes’ biggest fans. They are there from the beginning of the game to the very end. They are standing, chanting and stunting to support their athletes. The cheerleaders are not only there to cheer on the athletes, as part of their responsibility is to lead the crowds. They help the crowds build up the energy and enthusiasm needed to cheer on our teams. This energy and enthusiasm can help rally up any sports team to play to their best abilities. Cheering requires strength, dedication and confidence. 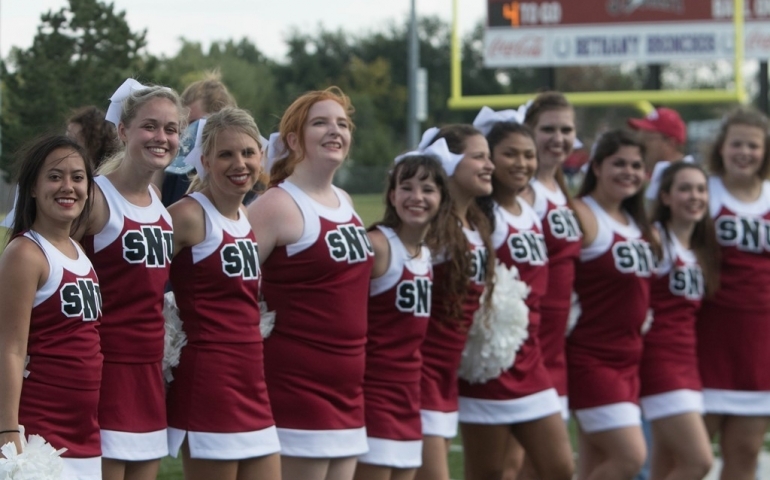 At SNU, we support and are thankful for our cheer team!